Dr. Eurie Hong is the Senior Director of Genomics at AncestryDNA. She was awarded her B.S. Degree in Biological Sciences from Stanford University and her Ph.D. in Molecular Genetics and Cell Biology from the University of Chicago. Afterwards, she worked as a Biocuration Scientist and subsequently the Head of Scientific Curation for the Saccharomyces Genome Database at Stanford University School of Medicine. 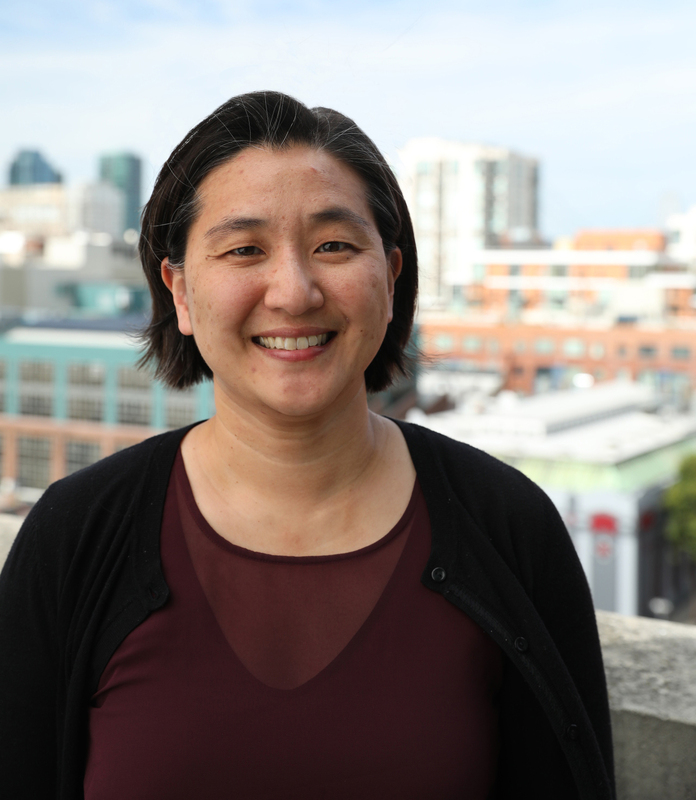 Eurie has also held positions as Senior Research Scientist at Stanford University School of Medicine and Project Manager of the ENCODE Data Coordination Center at Stanford University School of Medicine before joining the team at AncestryDNA in 2015. Eurie joined us for an interview to talk about her experiences in life and science. When she’s not at work, Eurie spends her time with her husband and six year old daughter. It’s exciting for Eurie to see her daughter trying new activities, and they recently went skiing together for the first time. In addition, Eurie enjoys cooking, eating, exploring different cuisine, and experimenting with her instant pot. At AncestryDNA, Eurie works on the algorithms that interpret the DNA provided in customer samples to tell people the regions of the world their ancestors may come from. She develops methods to analyze a person’s DNA and compare it to reference panels of DNA from other individuals. In second grade, Eurie’s class made body tracings that they were allowed decorate however they wanted. While other students drew their exterior physical features on their tacings, with her teacher’s encouragement, Eurie filled in hers with her internal organs. By high school, Eurie was fascinated by biology. She was captivated by the dissections they did in class and discovering how all of the body’s organs fit together and were connected. At first, Eurie thought she might pursue a career in medicine, but after indirectly learning the scientific method from her high school field hockey coach, she became very interested in asking and answering questions about the world. Eurie had the opportunity to work in a research lab in college, and she became convinced that a career in science was right for her. During graduate school, Eurie spent about three years without getting any usable data. Her project involved trying to purify a particular protein from a certain type of bacteria. Similar proteins in other bacteria purified beautifully, and Eurie attempted to use these same protocols in her chosen bacteria. Experiment after experiment failed, and finally Eurie got to the point where she decided this next experiment would be her last. It didn’t work. Eurie tumbled into despair wondering what to do and lamenting that she may have just wasted three years of her life on a project that went nowhere. Her advisor helped troubleshoot, and eventually Eurie was able to get results and finish her PhD. Getting out of this rock-bottom moment was a process, and finding creative solutions to overcome the challenges she faced was key for Eurie’s ultimate success. Last year, the team at AncestryDNA published a paper in Nature Communications describing their methods for using pedigree information from Ancestry to begin to understand not just how, but also why people are connected genetically. This is a new piece that they were able to incorporate into their product to improve the product experience and give people more insight into what they can learn from their DNA. This project represented a lot of work from many people, and it took a long time to get to this point. It’s been rewarding to see their research incorporated into a product and have an impact on people who are looking for insights into their family history. While working at Stanford, Eurie traveled frequently to Cambridge to work with collaborators there. The history and the architecture of the school is remarkable. Learning about the area, walking along the cobblestone streets, and exploring the surrounding neighborhood captured her imagination and was a lot of fun. In addition, Eurie had an opportunity to travel to the Galapagos Islands about ten years ago. She dreamed of going there after learning about the islands in high school, and once she was there, Eurie was awestruck. The animals were unfazed by humans, and she was delighted to witness the amazing dance of the blue-footed boobies and see white-tipped reef sharks while snorkeling. In graduate school, they had a polymerase chain reaction (PCR) machine, and PCR is notoriously finicky. There was a rubber chicken in the lab, and it became a tradition to rub the head of the rubber chicken for good luck before putting your samples in the PCR Machine. Forgetting this step was rumored to doom your PCR to failure. Though it didn’t really improve the outcomes of their samples, it was a funny superstition that everyone participated in. At Ancestry, they’ve been trying to re-start their weekly tradition of getting everyone outside to enjoy some friendly competition in kickball or dodgeball. Take the time to discover what is most interesting to you, and pursue it. There are so many questions out there that are waiting to be answered or explored. Always stay curious, and when you encounter challenges, strive to find creative solutions to get to where you want to be. Eurie has developed computational, bioinformatics, and software tools that analyze and interpret genomes of diverse organisms from baker’s yeast to humans. Today her work focuses on integrating genomic data with pedigrees and historical records to help individuals discover their family history. At AncestryDNA, Eurie has the unique opportunity to harness the power of the largest consumer DNA dataset in the world. She currently leads a team of population geneticists, computational biologists, statistical geneticists, and bioinformatic analysts to develop algorithms that integrate genomic data from over seven million samples with 80+ million pedigrees and 20+ billion records to provide consumers with unique and meaningful insights.